The newly launched Ducati 2017 Multistrada 950 Urban Sports Bike is an incredible bike for riding on urban roads and highways. 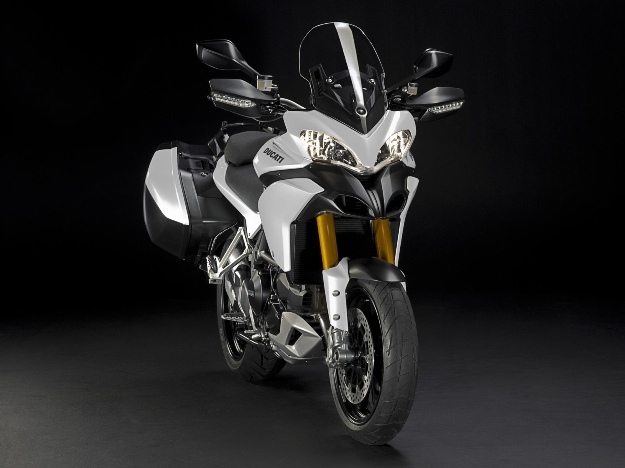 This bike feature provides comfort, style, and superior performance. This new Ducati bike features Testastretta 937 cc engine delivering the 113 horsepower. It’s 19 inches of front wheel provides the best grip and style. The comfortable ride is the primary objective behind the manufacturing of new Ducati 2017 Multistrada 950 Urban Sports Bike. It requires longest service intervals, which makes it economical and ideal for those riders who lead a busy life. For more style, a rider can use additional accessory packs to get most of this bike. Following are some of the main features and review of new Ducati 2017 Multistrada 950 Urban Sports Bike. 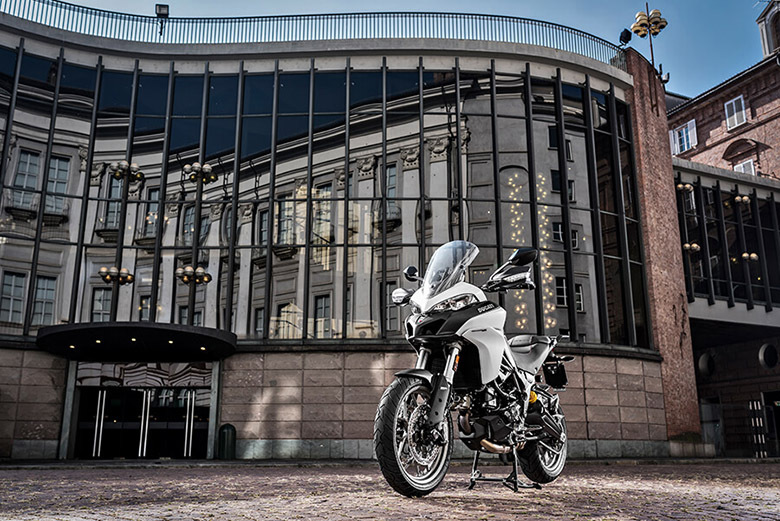 The overall design of new Ducati 2017 Multistrada 950 Urban Sports Bike is kept similar to the Ducati Multistrada 1200 Pikes Peak. The design is perfectly ergonomics, compact and gives the best riding experience. 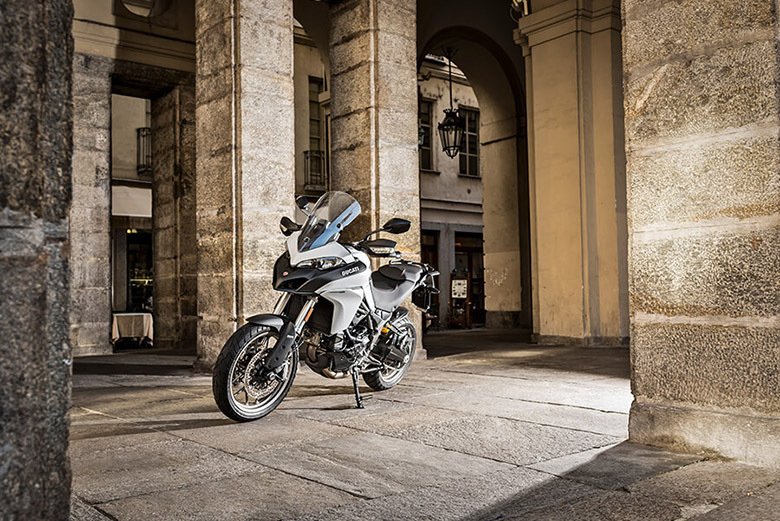 It contains the smooth LED front light giving the typical Multistrada shapes. The seat height is carefully adjusted and the engine is kept low to achieve the center of gravity. Each and every part is carefully designed to achieve perfection and stability. This new urban bike is the perfect combination of incredible design and quality frame. This bike is best known for its ultimate performance and outstanding control. The seat height is about 840 mm providing the comfort on its peak. 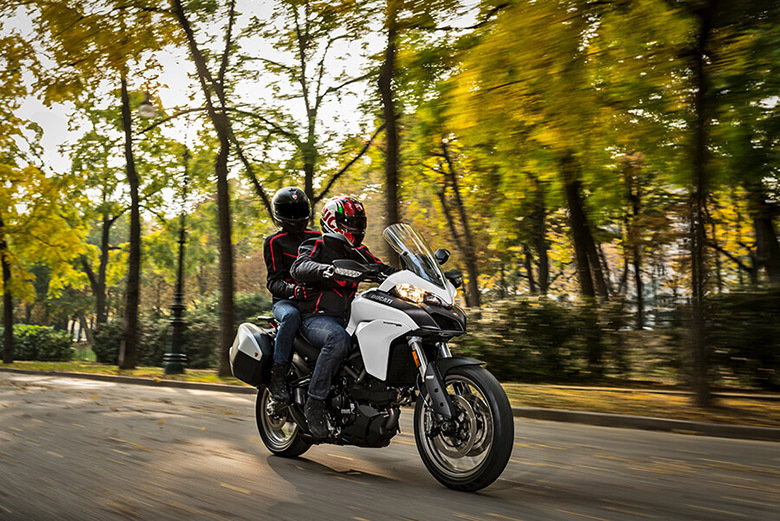 Its reduced weight as compared to other Ducati Multistrada models gives the best riding experience. It’s 19 inches of front wheel features the lightweight alloy, which guarantees the best comfort and enjoyment on all kinds of surfaces. The powerful 937 cm3 Testretta 11 degree twin ensures an excellent performance like the true Ducati bikes. The newly launched Ducati 2017 Multistrada 950 Urban Sports Bike provides the best riding experience. 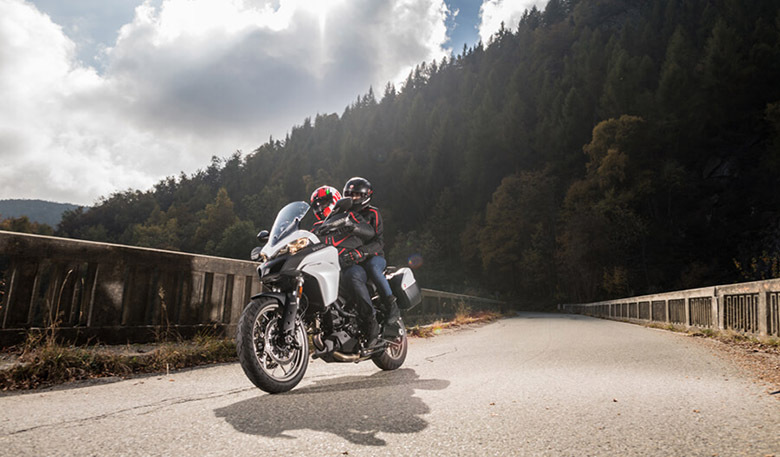 The special Ducati Riding Modes lets the rider to choose differed modes based on riding style and road conditions. This urban sports bike features four different riding modes i.e. Sports, Touring, Urban, and Enduro. All of these modes are programmed to act on the Ride-by-Wire (RbW) engine control system, on ABS and DTC intervention levels. The service internals of new Ducati 2017 Multistrada 950 Urban Sports Bike is scheduled on every 15,000 km, which reduces the costs and makes it economical. It is possible due to the use of quality and reliable components. Its engine has taken the service intervals on another level in terms of service scheduling. The valve clearance check is now required on every 30,000 km, which is one of the biggest advantage of having the new Ducati 2017 Multistrada 950 Urban Sports Bike. The all-new Ducati 2017 Multistrada 950 Urban Sports Bike features the twin cylinder 937 cm3 Tresteretta 11 degrees engine. This engine is Euro 4-rated and contains four valves per cylinder. It has the liquid cooling technology and the bore to stroke measurements are 94 and 67.5 mm respectively. The engine power amounts to the maximum of 113 horsepower at 9000 rpm and the maximum torque is about 96.2 Nm at 7,750 rpm. The compression ratio of new Ducati 2017 Multistrada 950 Urban Sports Bike is about 12.6:1. The twin cylinder Testastretta 11 degree engine comes with two new cylinder heads. These heads are redesigned with oil circuit and secondary air intake ducts on the covers. This bike gulps in the fuel mix through its new 53 mm cylinder-section throttle bodies, which are controlled by the advanced Ride-by-Wire system. This engine features the new control unit and an electronic injection system. Its exhaust system is the 2-1-2 type having the lateral silencer. This exhaust system layout is based on the two primary manifold, which merges directly in the single 2-chamber silencer. It contains the 2-1-2 collector and the catalytic converter as well. Two pipes exit directly towards the light and compact silencer. They are side-mounted in the high position featuring an aluminum alloy outer sleeves. The new Ducati 2017 Multistrada 950 Urban Sports Bike comes with alloy rims, which are mounted with the Pirelli Scorpion Trail 2 tires with the front of 120/70R19 and rear of 170/60R17. The Scorpion Trail 2 tires represents that they are best for off-road racetracks and for touring roads. These tires are specially designed to meet the demand of most of the riders. They are very strong and includes high mileage, consistent performance and perform well in wet conditions. The frame design features the new front Trellis made up of large-diameter yet thin tubing. The two lateral aluminum sub-frames ensures the maximum torsional rigidity. This Ducati motorcycle provides the ground clearance of 183.5 mm. Its shell-cast aluminum twin-sided swingarm is painted in black color, which gives an attractive look. 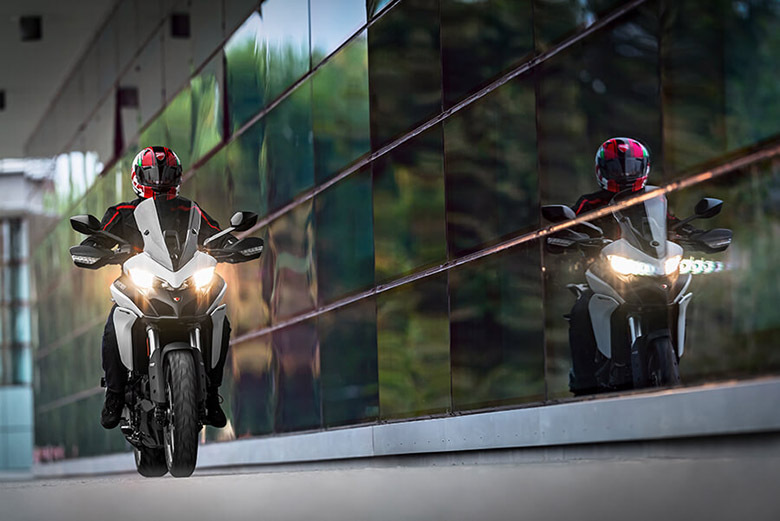 The front headlight presents an aggressive look and has technological design, which represents the legacy of Multistrada family. The rear LED light also provides the best light output. 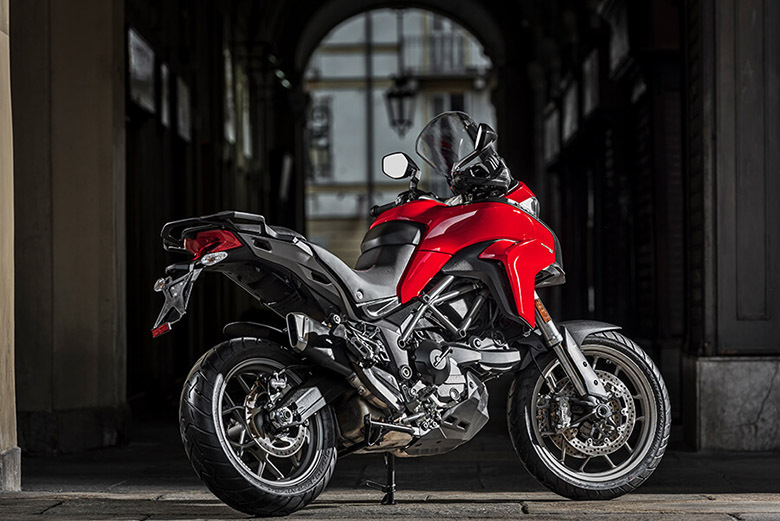 The new Ducati 2017 Multistrada 950 Urban Sports Bike is equipped with the Ducati Safety Pack DSP, which includes ABS and Ducati Traction Control to enhance its overall performance, control and boosting safety levels. This package is managed via four different Riding Modes i.e. Sports, Touring, Urban and Enduro for best performance and ultimate fun. This sports bike comes with the new Brembo braking system with ABS. It is controlled by the Bosch 9.1 MP control unit with an integrated pressure sensor, which is the part of Ducati Safety Pack DSP. The three-level system guarantees the short stopping distance and it is fully integrated with the Riding Modes. There are four different riding modes available i.e. Sport, Touring, Urban, and Enduro. Each of these modes is programmed to act on the electronic Ride-by-Wire (RbW). This article is all about the review of new Ducati 2017 Multistrada 950 Urban Sports Bike and it shows that it is an ideal bike for those who want power with style. Its powerful engine delivers the massive power and its long service interval reduces the cost of its owner. The chassis is compact and stylish delivers the best riding experience. The four different riding modes enable the rider to choose the best riding mode. The low seat height makes it fit a variety of riders. It is the bike with a number of features and one must purchase it and enjoy its ride.